In 2006 Dove was on a mission to show the world “real beauty.” As part of an ongoing campaign to make women feel comfortable in their own skin, the company released an ad showing the labor-intensive process of transforming a woman into a model. In sped-up time, her fresh face gets covered in makeup, her hair is curled into perfect ringlets, and photographs are taken. The real fun begins as she is photoshopped into digital perfection: her neck becomes elongated, her face gets thinner, her eyes widen. “No wonder our perception of beauty is distorted,” the ad concludes, like a somber anti-smoking PSA. The ad went viral. At the time, consumers were starting to become more aware of how prevalent photo-editing was in both advertising and publishing. Actresses like Kate Winslet were calling out publications for over-editing their figures, women literally took to the streets to protest Ralph Lauren’s Photoshop fails, and Jezebel was posting unedited photos of Faith Hill to prove to you that women’s magazines are lying to you. And in the decades since then, corporations have belatedly jumped on Dove’s bandwagon, as more brands and magazines cynically preach body positivity, cast “real” women in campaigns, and boldly proclaim to never Photoshop. With such scrutiny, you’d think that Photoshop’s tight, marketable grip on women’s bodies has loosened. And yet, there’s Celebface. “WELCOME TO REALITY” reads the bio of the private Instagram account. “If you don’t want to see the truth ➡ leave this page.” With over half a million followers, the account offers close, nearly obsessive dissection of the way celebrity bodies are constructed both on-screen and off. Red carpet photos of actresses are magnified to show on closer inspection that their faces are covered in caked and cracked makeup; photos of models and celebrities in and out of makeup emphasize what all the products are actually covering up. Photosets documenting the plastic surgery of celebrities, models, and influencers, offer a hypnotizing gradation of lips plumping and noses thinning, and often the person in the first and last photo are unrecognizable. 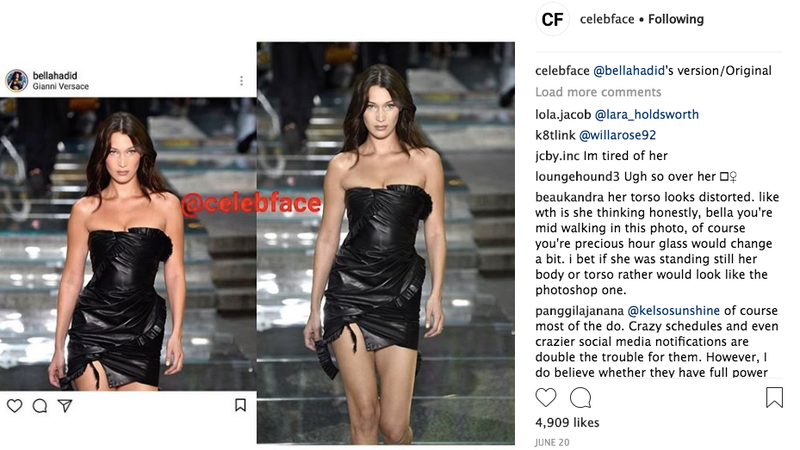 What’s more interesting than Celebface’s deep-dives into who has been smoothed with fillers and more extensive plastic surgery is the account’s fanatical documenting of how celebs are editing and staging their own photos. In the past decade since consumers and celebs were protesting excessive photo-editing in glossies, that same technology is more accessible than ever. Photoshop alone costs over $200 in 2018, but apps like Facetune or AirBrush get the job done on a much cruder level in the palm of your hand for just a few dollars. And in layering original paparazzi photos with their Instagrams, Celebface often makes a .gif highlighting exactly where a photo has been manipulated: Kim Kardashian slaps on a filter but also a smaller waist, while Kendall Jenner shaves down her chin, and Naomi Campbell makes her nose just a bit tinier. Every airbrush and digitally applied blush stroke solidifies the fact that you can be one of the most objectively pretty women in the world and still find a part of your body worth hating. The Photoshop that slivered women’s bodies into a tedious, thin ideal was once considered a symptom of sexist advertising and publishing industries that demanded protest. But on Celebface the Photoshop call is coming from inside the house and, confusingly, the women whose bodies we’re taught to covet are the ones calling. The draw of Celebface is that it reveals the “reality” of celebrity in unedited form. “Your page makes me feel so much better about reality vs. media personas,” one commenter wrote on a recent post. But scrolling through the account, I’m more interested in scrutinizing the construction and end results of their fakery. There’s an uncomfortable monotony that permeates the faces and bodies of Celebface, so much so that the account often posts photos of unrelated celebrities who look identical at first glance (for example, Zooey Deschanel and Katy Perry.) Much has been written about the fact that the Kardashians are increasingly cited as an inspiration for plastic surgery and you can see it on Celebface, even in the way women shape their eyebrows and wear their liquid lipstick. But this all gets more complicated when you take into account the Kardashians’s blatant and constant self-construction and self-editing. There’s a certain uncanny doubleness where women request replicas of faces created by surgery (which we might only ever see up-close in already edited photos). Since Instagram can embolden even the slightest dysmorphia, it’s also not surprising that a frequent focus of Celebface’s sleuthing is the newest and nebulous class of celebrity: Instagram influencers and vloggers. Looking at the account I’ll admit that many of these influencers, like Elisabeth Rioux, Kristen Hancher, and Kardashian pal Anastasia Karanikolaou, didn’t even register, but their popularity and “careers” are reliant on the creation of picture-perfect lives. Celebface doesn’t just point out the plastic surgery and photoshopping of these women but also shows how drastically different their bodies look in their posted Instagrams versus real life (“real life” meaning, of course, without the carefully curated lighting, posing, styling, contouring, and editing that makes the end result post-worthy). We know that the bodies of famous women like Kim Kardashian or Beyoncé or Bella Hadid are the result of work, attained through a careful, expensive regimen of dieting, exercise, professional glam sessions, or plastic surgery. But the revelation of Celebface is that the newly ordained desirable bodies that populate Instagram feeds simply don’t—and never can—exist in the real world. It has never been easier to look slimmer, fresh-faced, younger, or bigger-breasted in self-created images. As the possibilities for what digital bodies can and should look like expand and increase, so can insecurities. When every leg is a few photoshopped inches away, and waists can be cinched with an app, it feels like we’re supposed to be lusting after the bodies of digital avatars rather than real people. No matter how much botox they’ve had, or how much money they’re paid to wear designer clothes, the women featured on Celebface can ultimately only exist in the frame of a screen, where perfect bodies can be digitally rendered even more perfect.